No matter the season, Bridges Golf Course offers an elegant yet modern setting for your big day that is guaranteed to wow your guests. 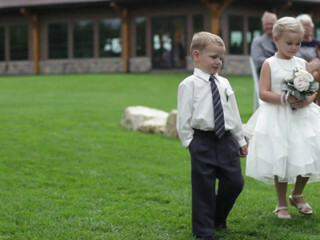 Bridges proudly unveiled its new outdoor ceremony site in the spring of 2012. 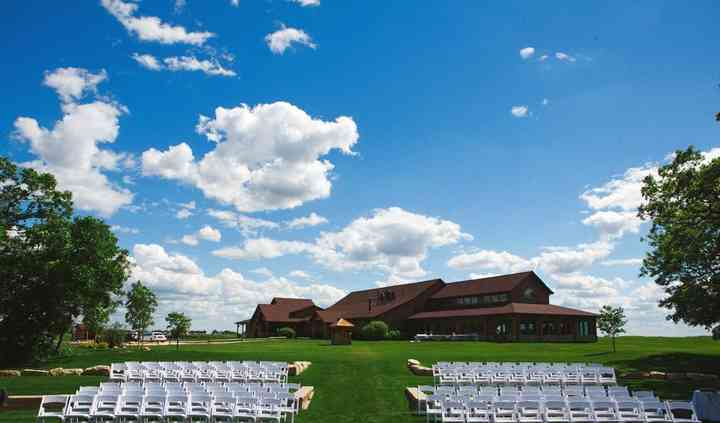 This venue comes fully landscaped with three tiers of amphitheatre-style seating, a setting that provides a majestic background for captivating photo opportunities, and more. 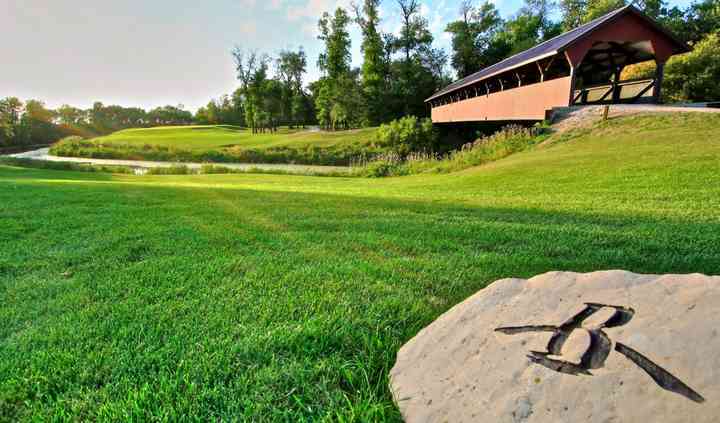 Whether you are inviting 20 or 200 guests, or whether your dream wedding takes place indoors or in the great outdoors, Bridges can accommodate you and your guests in one of the club’s two rustic, country-influenced event spaces. The Harvest Room can seat up to 200 guests and is completely enclosed by 28 picturesque windows, providing your guests with a beautiful, panoramic view of the property. 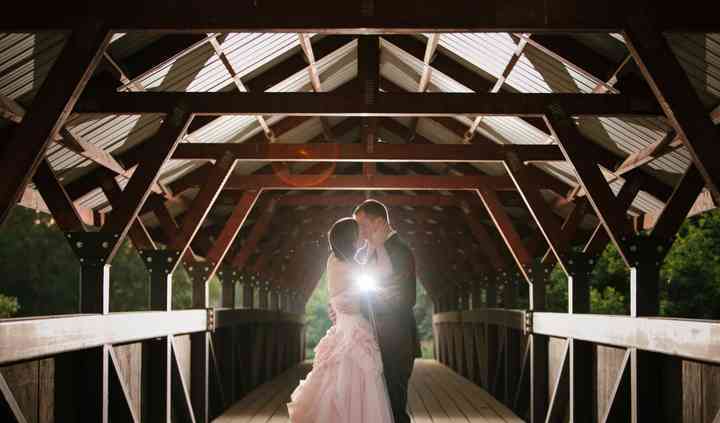 Pair that with the timber-frame pillars and vaulted ceilings and you have the makings of a perfect indoor ceremony. Looking for something more intimate? The loft at Bridges can seat up to 50 guests while still maintaining the modern, elegant setting of the timber-frame clubhouse. A private veranda off of the loft offers you and your guests the perfect setting to enjoy your big day day. Bridges Golf Course can offer your wedding reception the unforgettable menu your guests will be talking about for years. Creative presentations, healthy portions and full flavour make their menu options fantastic. Cuisine options include buffet, cocktail reception, hors d'oeuvres, plated, server(s) and tastings. In addition to weddings, Bridges is the ideal location to host anniversaries, baby showers, birthdays, bridal showers, corporate events, engagement parties, graduations, holiday parties, memorials and sweet 16s. Only a brief, 40-minute drive from downtown Winnipeg, the unique location of Bridges Golf Course allows you and your guests to enjoy the convenience and proximity of the city and its amenities while being amongst the natural, scenic beauty of Southern Manitoba. The venue was absolutely beautiful. I had a wedding in November. The food was amazing and I had so many compliments from guests that it was the best wedding they had ever been to. Maegan and Corey ... Read more were excellent to work with. The day went off without issue and I was able to relax and enjoy every moment! Bridges was amazing. From the staff to the food and clean up we were floored. We couldnt have had a better time at this venue! We were definatley recommend them couples looking for the rustic charm ... Read more wedding. Bridges is an amazing venue we would recommend to anyone! 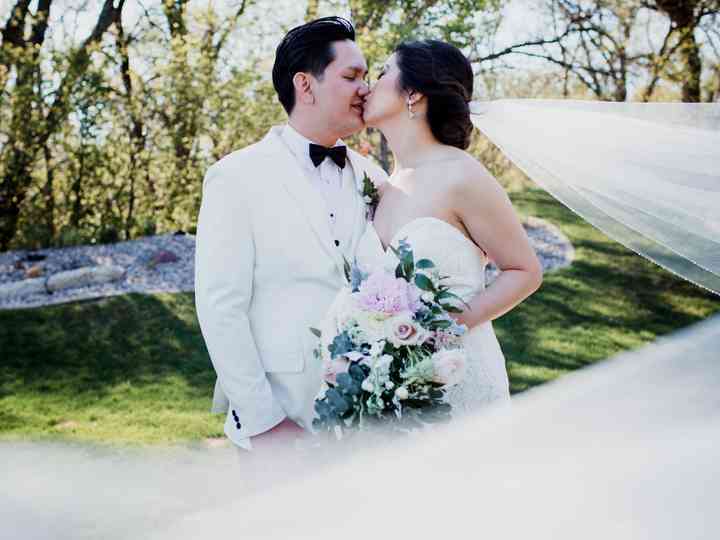 The Stunning landscape was located a perfect distance from the city, and the atmosphere was super inviting for our guests to relax in between ... Read more the ceremony and reception. The staff at bridges did everything possible to make our day run smoothly and care free, always accommodating any of our requests! Most of all the price was so right for us. Right in our resonable budget, Bridges offers prices we could not get anywhere else for that value. Best. Day. Ever! We had the most amazing wedding with Bridges! The staff and services were incredible. The food is AMAZING! We received nothing but compliments on how great the dinner was. 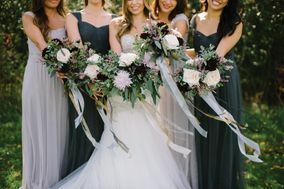 Read more We had the most amazing wedding with Bridges! The staff and services were incredible. The food is AMAZING! We received nothing but compliments on how great the dinner was. Great location with beautiful windows all around allowing for natural light. The venue has a nice rustic feel and the grounds are gorgeous. Food was great, service even better. Loved it. Read more Great location with beautiful windows all around allowing for natural light. The venue has a nice rustic feel and the grounds are gorgeous. Food was great, service even better. Loved it.